Melbourne four piece The Hiding have recently released their debut EP, which given the comparative success of the anthemic, textured style of pop rock that they play, it’s an EP with a potential massive reach not only here in Australia, but undoubtedly the USA. Million Miles Away opens the EP with it’s boundless energy and electro rock tinges, whilst 6 Billion Voices sees the band at their most anthemic and a standout choice as a single, well at least for me. Keys/piano play a large part of driving The Hiding sound, but on Waterfalls, guitars and bass take more of a prominent spot, a track that really took me back to the bouncy 90’s pop rock of Third Eye Blind. Produced by Jimi Maroudas (Eskimo Joe, The Living End) and mixed by Mark Needham (The Killers), the sound of The Hiding is all about atmosphere and space and letting the lyrics and music seep their way into our ears, as opposed to bombarding the listener with a wall of sound. 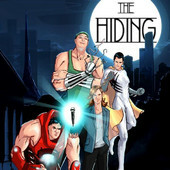 If bands that lyrically have a story to tell against a backdrop of accessible pop rock are your thing, then The Hiding will also be YOUR thing. As an EP, it’s a great introduction to the band and with gathering exposure both locally and internationally, it won’t be long before many more are captured by the musical charm of The Hiding.